Behold: my new "standing desk." Two weeks ago I was developing a lot of tension headaches after working at my desk. 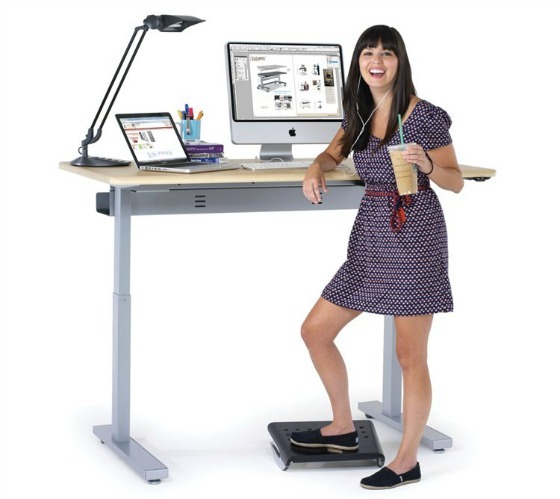 I started pining over the idea of a standing desk. I wanted to be as happy as that girl. I mean, look at how chic she is, with her Apple computer and Zooey bangs and venti-sized Starbucks latte and fancy footrest but surprisingly lame shoes. But man, standing desks are expensive. I researched all sorts of options, including modifying cheap IKEA desks and whatnot. I whined to my husband, who wisely pointed out that I could probably just build on top of my current desk. 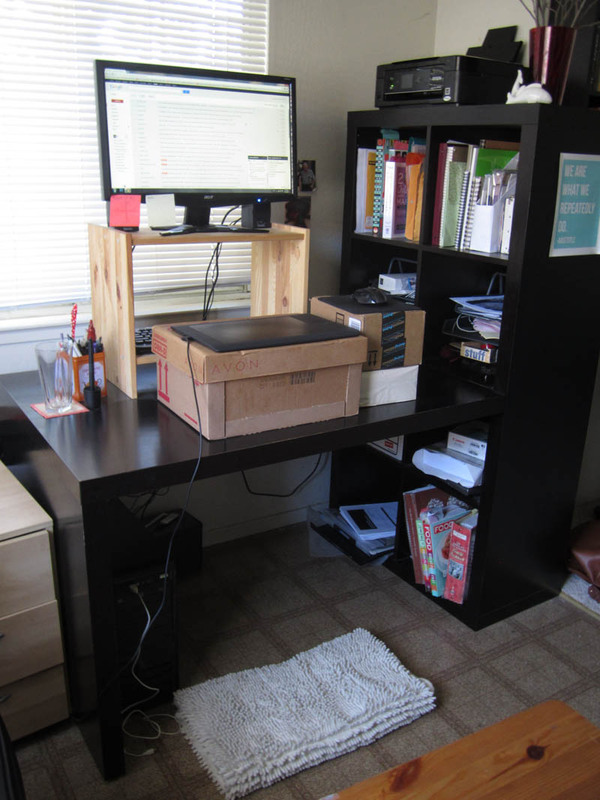 I grabbed my nightstand and some cardboard boxes and voila: my standing desk was born. I've been using this standing desk for about 2 weeks now. I bought a tall bar stool on Craigslist, so that I can rest my legs from time to time while still using the standing desk. I alternate between standing and leaning on the stool pretty much all day. I feel great. Tension headaches are rarely a problem anymore. I am a standing desk convert. YES. I have a standing desk cobbled together out of Ikea parts, which I use for as much of my computer work as possible (although I've never managed to look as groomed and smug doing it as Standing Desk Girl there). It's almost completely eliminated the killer neck and back pain I used to get from working. The only trick now is to rig some sort of standing desk for drawing - I still do that hunched over a drawing board. btw, congrats on graduating AAU and entering the freelance workforce. You're my competition now - scary!! Aren't most drafting tables at a standing height? I know what when I was looking for drafting chairs, they are really tall. Thank you, Wylie. The thought of competing against you is truly intimidating. I love, love, love the piece you just posted on Facebook. haha I love your description and pining after the girl in the picture. And yes, she does have some lame shoes. Well, I hope your rigged desk keeps working out for you. I was getting headaches working on the computer too and I moved my studio around so there wasn't as much glare on the monitor and that seems to have helped. I do like standing and working, though. I tend to step away and take eye breaks more often when standing. Wow, what a great idea! Thanks so much. I'll be trying to fashion my own here in the next day or two.